The shared shaft house for Ahmeek No. 3 and No. 4 is shown in this photograph, taken on this day in 1963. The image is courtesy of the Calumet and Hecla Photograph Collection. There is one more long weekend ahead of us before classes resume on Tuesday, September 4. A splendid opportunity to hit the road and explore the Copper Country! One way or another, all roads lead to copper and the rich history of the region. 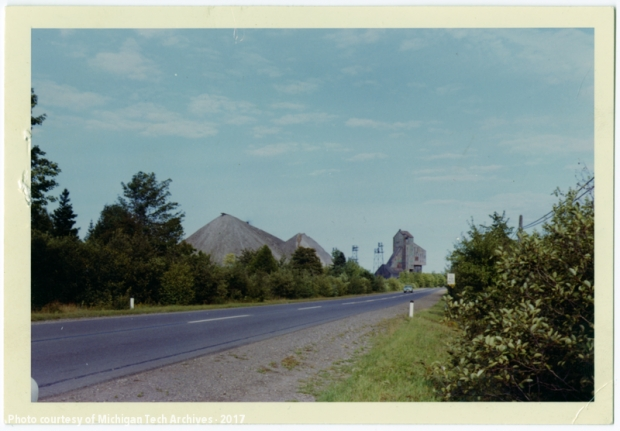 Today’s Flashback Friday looks down the road to points north of campus, offering a glimpse of Ahmeek, Michigan. The village of Ahmeek, a small community in Keweenaw County, derives it name from the Ojibwe amik, which means beaver. The village grew up around the Ahmeek Mining Company, which opened for business in 1903. The founding of the village is credited to Joseph Bosch, of Bosch Brewing Company fame. The Ahmeek No. 3 and No. 4 site is featured in this photograph from August 31, 1963. Although the Ahmeek Mining Company began operations as an individual enterprise in the early 1900s, the company was initially organized in 1880 as a subsidiary exploration wing of the Seneca Mining Company. Initial extraction took place through two shallow shafts, but the lode proved to be unreliable and production was irregular at best. In 1903, with the discovery of the Kearsarge Amygdaloid lode, the Ahmeek Mining Company became a separate operation. The operation consisted of four shafts that reached a depth of approximately 3,000 feet. The uniqueness of shafts No. 3 and No. 4 is highlighted in the photograph, demonstrating that both shafts were serviced from a common shaft house. There is certainly more than meets the eye when you compare the surface to the underground architecture at this site! In 1923 the Ahmeek Mining Company was absorbed by Calumet & Hecla. Operations eventually suspended in 1931. After the Great Depression ended, the mine reopened in 1936 and continued until the mid 1960s, with most accounts indicating that the mine officially closed permanently in 1966. Wherever your Labor Day weekend adventures may bring you, we hope our Huskies all make it back to campus safely with plenty of good stories from the summer! Please note, the Van Pelt and Opie Library will be closed on Monday, September 3 in observance of Labor Day. The library, including our department, will reopen with regular hours on Tuesday, September 4.